Android is built in a way that allows "core" portions of the operating system to be replaced with applications written by a third party. That is, someone not the manufacturer, or Google itself. Nowhere is this more evident than the various Launcher (or Home) apps you'll find in Google Play. The user-facing portion of the operating system — the home pages, the widgets, the application drawer and the icons — can be replaced in one fell swoop. This is a good thing because chances are once you get a few Android fans together, you'll likely see a big difference in the way they want their phones and tablets to look, act and feel. Inevitably, Nova Launcher gets mentioned. There are good reasons for this. Nova Launcher is one of those gems that works right out of the box but has almost endless options to customize pretty much all of it. As a basic Launcher or Home replacement, you have the home screens to place shortcuts and widgets on, icons to represent all of your installed applications, and a drawer to hold them all. If you don't like the way your home screens and app drawer look on the phone you bought, you can install Nova Launcher and replace it all with one install. And it will all just work. But the real draw of Nova Launcher is the endless customization. Nova Launcher allows you to make your Launcher look and act the way you want it to look and act, versus you having to settle for something someone else envisioned. This goes beyond the basics you'll find with other launchers, and dives deep into some micro-management style settings to allow for control of just about everything. Jared DiPane: One of the things I really like about Nova Launcher is the way it uses custom icon packs, and how I can get my screen to look just the way I want it to. While almost all launchers let you apply custom icon packs, I really like the granular control that Nova gives me. From being able to mix and match icon packs, to being able to change the icon size for the dock, home screen pages, and app drawer independently, the options are unlimited. In addition to being able to customize the icons, Nova gives me the option to set different dock backgrounds, making it even more custom. If one day I feel like I want to have an iPhone style on my G4, I can add a dock that resembles it, change up the icons and placement, and boom, a whole new feel in just a few minutes. And there's a lot more to customize in the look and feel department. You have control over the size of those custom icons, the padding between them, the labels underneath them and even the number of rows and columns in both your app drawer and on the home screens. One of the coolest features allows for a scrolling dock, where limitless icons can rest for you to flip through. Things don't stop with the icons and dock. You have control over animations, the way your wallpaper scrolls (or doesn't scroll if that's how you want it) and placing of your home screen widgets. Want portions of widgets (you get to resize them all) to overlap so you can create a cool design? Nova can do that. And more. The paid version (Nova Prime) even allows "swipe" actions — for example showing my bookmarks when swiping up on the Chrome icon. Custom is the key here, and Nova Launcher gives you the options to focus on all the fine details of what you see on your screen, how it all looks and how things work together. Russell Holly: The core of any personalization experience is getting to the stuff that matters to you as quickly as possible, and when you purchase the Prime upgrade to Nova Launcher you gain access to quite a bit to accomplish that goal. Nova's gesture list includes single and double-finger gestures that can do just about everything. 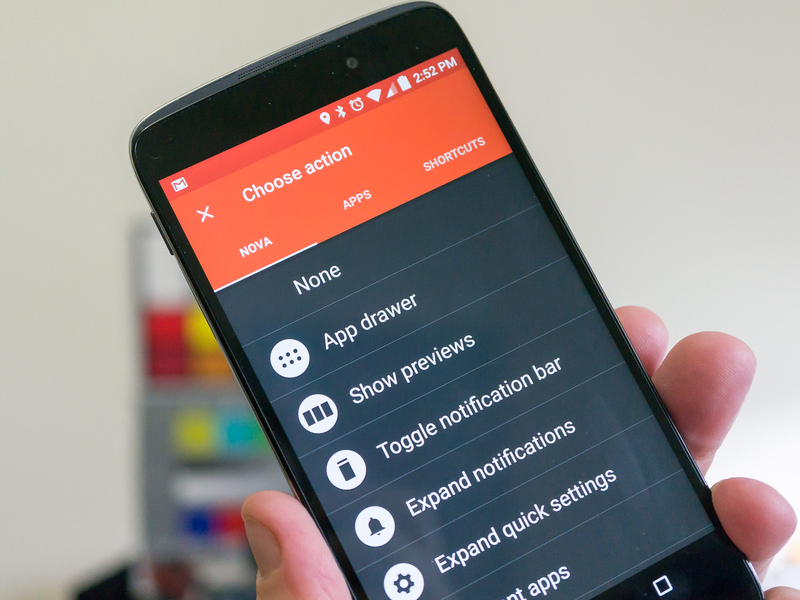 You can launch apps, access settings, and access the app drawer or notification panel without touching any of the regular buttons. Instead of just opening an app, you can access specific features within different apps. My personal favorite is jumping straight to the compose function in Google Inbox, but the list of things you can shortcut to if you know what you're doing is pretty impressive. But that's just the beginning. You can use gestures anywhere on your home screens as well. Swipe up, swipe down, double tap, swipe with two fingers — these gestures (and more) can be set to do things like open your app drawer, pull down the notification shade, open your recent apps and more. You can even deep dive and open activities that you wouldn't otherwise be able to run — things in your engineering mode tests or activities of the core OS. The best part is that you can assign different gestures to different things in different places. Swipe to open a folder, swipe an icon to open that app to a certain spot (like Russell's Gmail example) or swipe anywhere to do something like fire up Google Search. Both power users and novices alike will find the gestures and input tools useful. They are well worth exploring! For me, the best features in any custom launcher are the ones that allow me to set my app drawer the way I like it. Some apps that I need to keep won't be used very often, while some get used all the time. Having a way to group and sort everything is important. Nova Launcher is pretty sweet here. I can start by hiding the icons for apps I don't ever need to see — bloat that can't be uninstalled, license key apps, core apps that I've replaced via Google Play and the like — so I don't have those icons staring me in the face, never to get tapped. Having these hidden reduces the clutter, making it easier to sort the apps I will use. With the addition of Nova Prime (a recommended $4.99 purchase if there ever was one) I can take what's left and sort it into groups and folders (or even tabs!) right inside the app drawer. Of course, you have control over the background color, the scroll effect and even whether you want horizontal or vertical app drawer pages. Yes, Nova Launcher may be the best thing that ever happened to Android. Endless customization (without fiddling or flashing anything) is important to plenty of us. Android has the reputation of allowing anyone to do just about anything to the way their phone looks and how it performs the basics, and Nova Launcher gives both the experienced and the veterans among us an easy way to do all of it. If you need a change, or just want to have more control over how your phone looks and the way it does things, Nova Launcher is a great place to start.